At West End Bakery, we believe that quality products start with quality ingredients. That’s why we bake everything from scratch. Unlike store bought products, our home-baked goods are made with all-natural ingredients, just as if you were making it yourself. We also pride ourselves on our extremely wide selection. We offer an assortment of bread and buns, baked fresh daily, in addition to scones and tea biscuits. We are also happy to offer our unique Coloured Bread. Wonder what Coloured Bread looks like? Come to the bakery to find out! Looking for a quick take-home meal? Pick up one of our home-made quiches, pizzas, or meat pies, or dine-in, in our café. 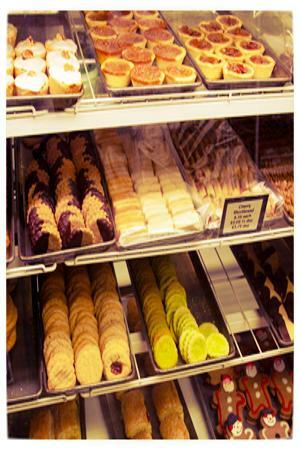 Don’t forget dessert...we offer cookies, loaf cakes, muffins, danishes, tarts, squares, éclairs and puffs. Or try our black forest cake or carrot cake, perfect for entertaining. We also offer special occasion treats and catering, including wedding cakes, seasonal baked goods, fruit cake, gingerbread, high end birthday cakes, and custom cakes for special occasions.